Basic as designer makes Bill Webb more easily to direct the "wild" imagination becomes a reality. For him, there is no limit in fantasy, including familiarizing the two great powers motorcycle modification flows. 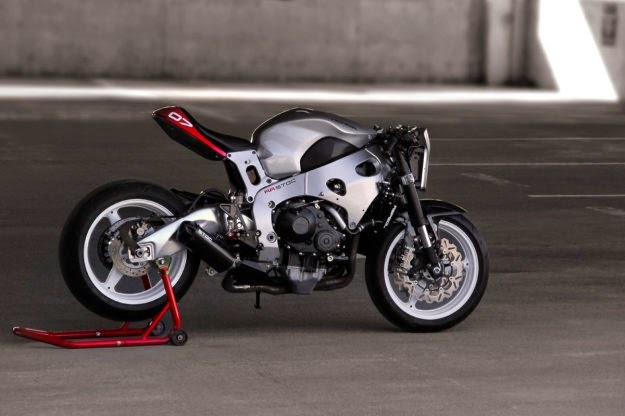 He managed to combined a retro café racer aura of with the violent looks of streetfighter. 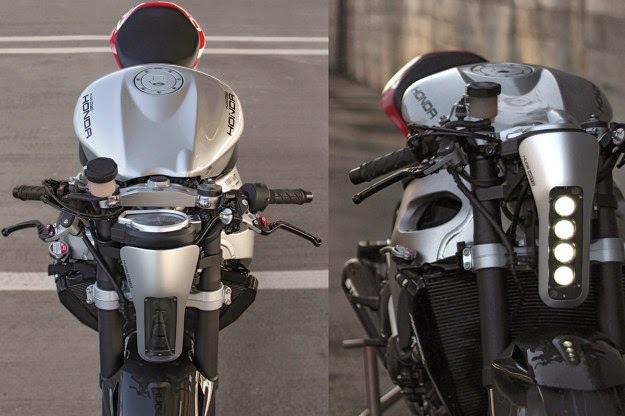 Two different streams of the time embodied in the Honda CBR1000RR modifications named Café Fighter. The result, an outstanding retro-futuristic rides present in sight. 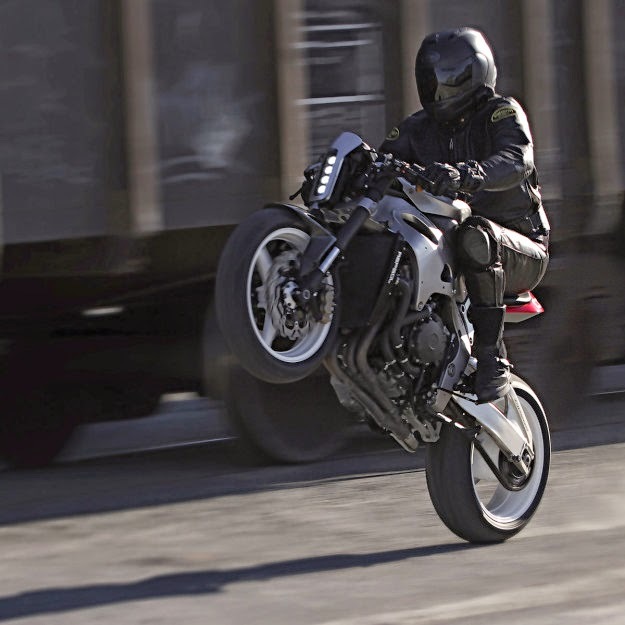 "I want to embrace modern technology to create the perfect streetbike with café racer philosophy. So I am looking for a popular modern sportbike with strong capabilities that have a beautiful frame hidden behind the body," said Bill. 2009 Honda CBR1000RR Repsol Edition is taken as the base for this modification. This bike is considered to be tough with the ability to accelerate and easier control. Advanced technology is also much pinned on it, made him feel fit picked to represent his wishes. The beauty of engine and frame are maintained. Then Bill creates a single seat that seemed fused to the body. 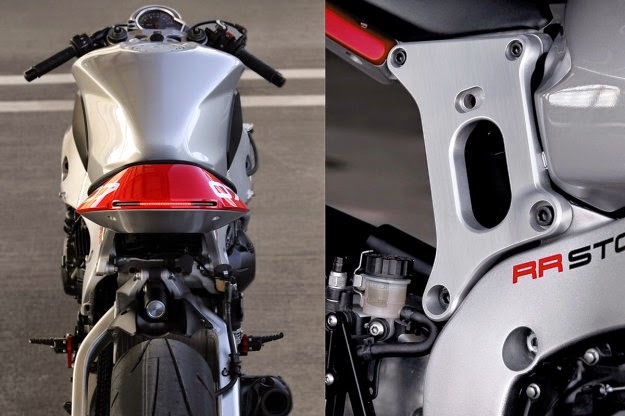 Its fairing made minimalist for easily precise, produced and reproduced, and not difficult to mounted fitting on the CBR1000RR production of 2009-2015. Bill's advantage as an industrial designer is ease of use sophisticated tools to translate design. No need weld expertise, enough with sophisticated machines Webb can lathe the chunks of iron with high precision according to the computer design. Smart solution in this case is, the seat is taken from Ducati Panigale inserted into the seat frame is made of ABS polymer. This component is designed to fit to be associated to the subframe. Then he made a holder for sensors and other small devices with sleek and compact. It means that the weight can be reduced as much as possible, and then visually look more clean. The lights were made custom with a futuristic design. Model of projector headlights arranged vertically. While the rear, the lights are united by a single seat section. This neatly modifications, thanks to "manufacturer technique" owned by Bill Webb makes the modification results look very neat, like motorcycle production coming out of the factory. 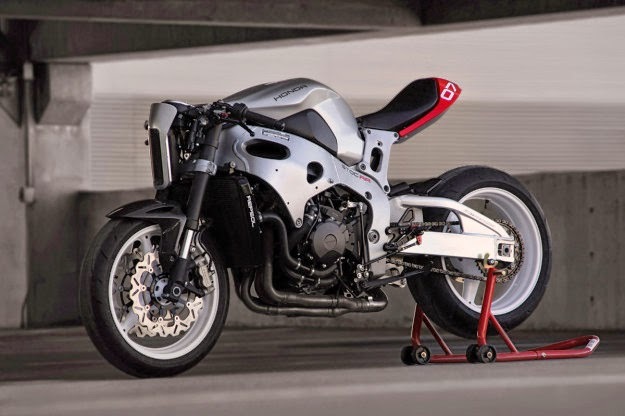 Bill even consider this work as a concept that can be marketed to the other CBR1000RR owners. All components are mounted very compact and can be easily dismantled and reassembled.